Brian Lowry of Variety to Sarah Silverman: Your dirty mouth is ruining your career, young lady. 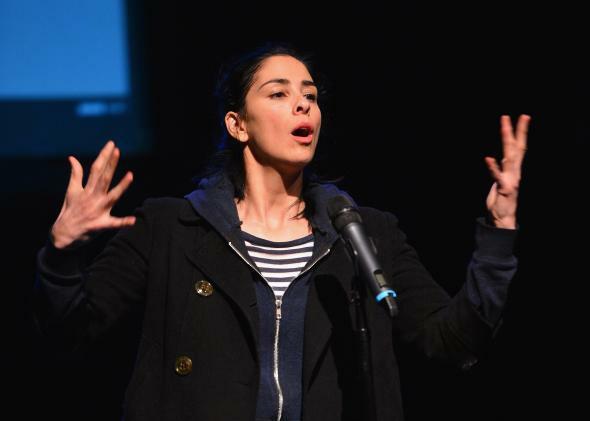 Sarah Silverman says the F-word while not wearing a dress. “Ladylike”: A concept that was so clearly invented for the sole purpose of keeping women from having as much fun as men that it is finally dying an ignoble death, kept on life support only by your Great Uncle Morris, who really doesn’t think girls should talk like that. Oh, and Brian Lowry, TV critic for Variety. Earlier this week, Lowry denounced Sarah Silverman’s latest HBO special “We Are Miracles” because Silverman works blue. “Despite all manner of career-friendly gifts—from her looks to solid acting chops—she’s limited herself by appearing determined to prove she can be as dirty and distasteful as the boys,” he scolds. Clearly, if Silverman doesn’t shape up and learn to talk like a lady, her nascent career (now 20 years running) will die in the crib. It’s easy to be mad at Lowry for his condescending nonsense, but I’m actually in awe of his ability to hit nearly every major trope of the misogynist blowhard in a mere 500-word piece. All of it wrapped up in a mansplaining frame that assumes that Silverman is an ingénue who is only making these choices because she has been naively manipulated into thinking she has to be one of the boys. Lowry doesn’t even entertain the possibility that Silverman really does have a perverse sense of humor and is using her act to express it. So, yes, it’s a masterpiece. If only he’d had a little more space, Lowry could have suggested that Silverman’s going to die alone with her cats, or worry that young women in the audience are getting the wrong message. He did at least get in a dig at Maureen Dowd, who, according to Lowry, is one of Silverman’s few fans. Broads!